Are you searching online for an “electrician near me” on Google. It isn’t an easy to task to find a good electrical technician because most have limited skills and some don’t caters to certain parts of the city. Shut down the midnight manhunt and just visit HouseJoy.in to hire a reliable electrician. Registration takes only a few minutes and the service provider caters to homes and offices across the city. Experts at HouseJoy are well-versed in a variety of home care and home repair services. You can easily make a booking that caters to electrical maintenance of wiring, fixtures and meters. So hurry and get your work done with help from HouseJoy. Do you need a professional who is experienced in electrical maintenance services in Hyderabad? You can find a crew of electrical experts at HouseJoy. The team of technicians are well-versed in installing electrical switches and fuses. They can help you create a new electrical point, install a three-phase panel board and main control board. If you’re thinking of upgrading your lighting system, you can count on HouseJoy.the team an help you install tube lights with panels, fancy lighting fixtures and do any other electrical work related to sockets and holders. Do you want to get a dimming dial for the lights in bedroom or have a chandelier installed above the dining table? HouseJoy can help you get the job done. They can also help you with installation of ceiling fans. The electricians are trained and experienced in installing lifting fixtures and ceiling fans of all types and brands. Whether you’ve moved into a new home and want to make a few changes or need to replace some old wiring, HouseJoy has experts who can help you. You can easily make a booking online for electrical wiring services in Hyderabad with HouseJoy. The team of electrical technicians at HouseJoy are trained and certified to carry out all tasks related to wiring of residential or commercial premises. You can count on them to remove old or faulty wiring and install new and improved wiring. They can help you with repairs and maintenance of wiring too. These professionals are experienced and efficient when it comes to electrical work. You can be sure that they will get the job done without you having to worry about anything. So make a booking from your laptop, or download the HouseJoy app and place an order from your phone. The HouseJoy app is very useful especially if your you’d like to book different services quickly and easily. 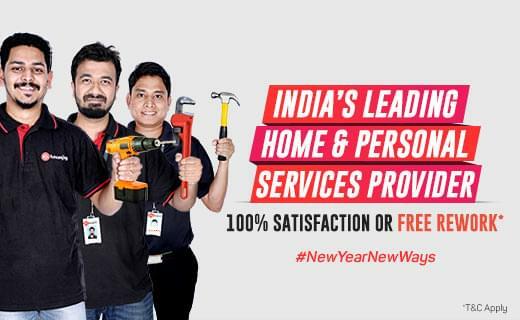 HouseJoy is India’s first personalised service provider. It caters to a range of home care and home cleaning needs. You can book carpentry services, pest control services, deep home cleaning services, appliance repair services, at-home beauty care services, flower delivery services, puja/pandit services and more for any part of Hyderabad. This makes HouseJoy your one-stop solution for all your problems. Stick to HouseJoy and you can throw out all those useless brochures/flyers and delete those random numbers for help around the house. When you book multiple services with HouseJoy, a dedicated relationship manager is assigned to take care of your tasks. The personal manager from HouseJoy Assist will make sure the services you select are completed in a timely and orderly fashion. Have your ever called an electrician for help and after the discussion is complete he tells you that he cannot travel all the way to your house? It’s frustrating to search high and low for a reliable technician who will visit your home and get the job done. You don’t have to scour the streets to find an electrician or repair service near you. Just login to HouseJoy and make a booking for electrical services in just a few clicks. Choose from installation or removal of inverters, lighting fixtures,ceiling fans and switches. You can also make a booking for creation of new plug point, repairing faulty wiring and maintenance work. Power cuts in today’s world is like shutting life down. It’s no longer just the matter of lights and fans switching off but also other electrical sources of entertainment. A sudden power cut means you can continue watching that movie you downloaded on your computer. You can’t charge your cellphone if the battery is dying. And worst of all, the wifi is gone which means you won’t be able to stream music videos or chat with your friends. Save yourself from the darkness by installing a reliable inverter that will provide your home with backup power. If you need help with removing or installing an inverter, you can get help from HouseJoy. They know exactly how to get the job done. And if your inverter breaks down you can get help at HouseJoy instead of searching for an inverter repair service near you. Do you want to upgrade your abode and make it a home of the future. Add some magic with the help of smart home solution services from HouseJoy. Home automation services makes life so much better. Don’t hesitate with the installation of a security system just because you don’t know how to go about it. The electrical team at HouseJoy can help you install surveillance systems of all kinds. If you’re trying to upgrade your home with a smart lighting system or efficient energy system, the experts at HouseJoy can get it done for you. And if you’re trying to move into the future with Google Home, HouseJoy can help you take the leap forward by installing and setting it up for you. One of the useful services provided by the electrical expert at HouseJoy is a Full Home Health Check in Hyderabad. This will help you identify electrical problems in your home, help you get it fixed and make your home a safer place. Over the years, homes are subjected to wear and tear. Even lighting fixtures, switches, wiring and sockets wear out or breakdown. The Full Home Health Check is a great way to diagnose these problems and get the help you need. Makes booking for it at HouseJoy and their team of experts will visit your home and do a detailed inspection of it. They will let you know their findings and also inform you of what can be done to solve the problems. And since HouseJoy takes care of all electrical-related services, you can make a booking with them for all the help you need.